Now 11 years of age, “the 34 cow” as we call her, is having a major impact on our genetics. She exemplifies everything we look for in that she is very fertile, easy fleshing, structurally correct with a sound udder and sound feet and legs. Her grandson HRA RW 813 has left us with daughters that parallel her in type and function. We have flushed her extensively and have her daughters by INTENSE 6844, EUREKA, CLAYBROOK RITO BAND 5000 and AAR REALLY WINDY 1205. We are expecting calves by RITO 054 GDAR, VANCE TOP DAWG and AAR NEW TREND in the spring of 2015. 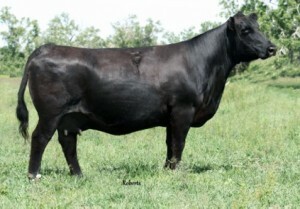 Her sons by 1205, CH Quantum 6247 (Cedar) and Traveler 23-4 will see use in our herd in 2015.